Deb's Cup of Tea: Enough? A friend has a birthday tomorrow. He jokingly said his Halloween card didn't have enough sitckers on it. I mentioned his upcoming birthday and that I would rectify the problem. I'm not sure if this is enough. 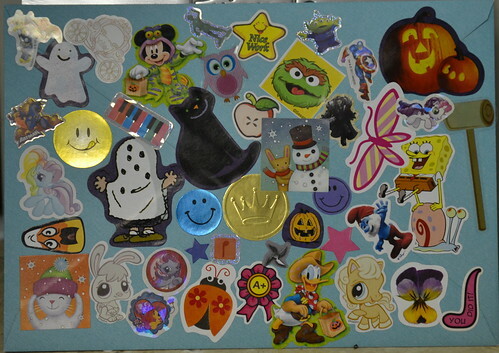 I used at least one sticker from every different kind I have and, in some cases, more because there were stickers that fit a certain spot. Maybe I need more different stickers? I can't wait to get his reaction to this.